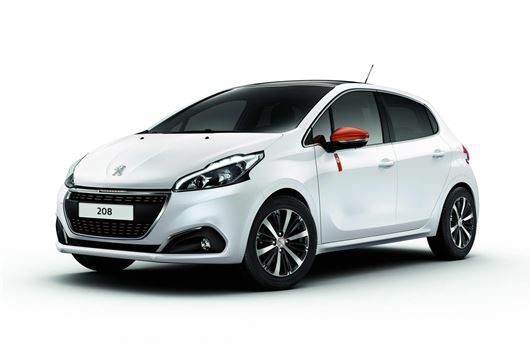 Peugeot has unveiled tennis-themed Roland Garros editions of the 108 and 208 small hatchbacks, with the former called 108 Top! and the latter simply 208 Roland Garros. Both are available this month (June 2016), with the former priced from £13,360 and the latter from £17,695. The 108 Top! comes as a three or a five-door and has a distinctive retractable cloth hood – hence the name, presumably – and is further distinguished by orange door mirrors. The 15-inch alloy wheels have matching orange hubcaps. Standard kit in the 108 includes navigation, air conditioning, electric heated door mirrors, keyless entry and a rear-view camera. The dashboard and nav screen housing are both white, and the seats come in a red and black striped cloth. Powered by an 82PS 1.2-litre petrol engine putting out 99g/km of CO2, the 108 Top’s £13,360 asking price (for a three-door) makes it the most expensive 108 available, some £5000 more costly than a base model 108. It’s even more expensive than the brand new 108 GT Line, in fact, which Peugeot has also announced. At £12,760 for a three-door and £13,160 for a five, the sporty 108 GT Line replaces ‘Feline’ trim and comes with new alloys, tinted rear windows, a new grille and black door mirrors. Back to tennis, the 208 Roland Garros, which is five-door only and costs from £17,965, is distinguished from non-tennis versions mostly by its orange mirror caps, though look closer and you’ll spot Roland Garros badges. A panoramic glass roof is standard, as are two-tone leather chairs with orange stitching, DAB radio, navigation, cruise control and climate control. There are two engines to choose from, and two gearboxes: the 100PS BlueHDI 1.6-litre diesel is manual-only, but emits just 90g/km CO2, while the 110PS 1.2-litre turbo petrol unit comes with either a manual or a six-speed automatic.